About this Virtual Run: Seize the day by running or walking your choice of either a 5k, 10k, or Half Marathon distance whenever and wherever you want! 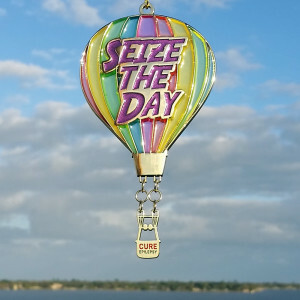 All registrants will receive a personalized electronic race bib and beautiful hot air balloon medal. The medal is partially translucent and more than 5″ tall! About the Charity: Tireless in its efforts, Citizens United for Research in Epilepsy (CURE) won’t stop until a CURE is found for epilepsy. CURE is the leading nongovernmental agency fully committed to funding research in epilepsy. The organization was founded by Susan Axelrod and a small group of parents of children with epilepsy who were frustrated with their inability to protect their children from seizures and the side effects of medications. Unwilling to sit back, they joined forces to spearhead the search for a cure.